ANNEKE VAN GIERSBERGEN is a name that is well known within the Metal and Rock world. She started in the Metal scene with THE GATHERING and then gaining even more fame with her collaborations with DEVIN TOWNSEND, her own Metal band VUUR, and her work with AMORPHIS. In addition, she is a frequent collaborator on the AYREON project and her own solo career in addition to other collaborations she has done with such musicians as Danny Cavanagh, Martijn Bosman, and Arstioir. In short, she has a done a ton of stuff across a variety of genres but no matter what she does, she does it amazingly well. Her latest project is “Symphonized,” a live album in which she takes a variety of her songs and sings them backed with nothing but a symphony (Residentie Orkest The Hague)—no additional rock or metal band plays here. In short, this live album is mind blowing good. Despite being a fan, even I wasn’t aware of just how well her music translates to other feelings or genres—the symphony and its many instruments work so well with her own voice and songs that if I knew nothing of her before this review, I would never have thought that any of the songs were once more rock or metal oriented. 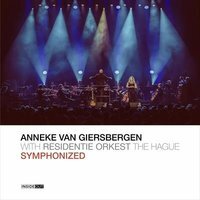 I don’t know a whole lot about the Residentie Orkest The Hague symphony but without a doubt these musicians represent the best in their field, as they create such epic, exciting, and often times moving and beautiful music. One of the most powerful highlights is the very first track, “Feel Alive,” a decidedly pop rock song from her solo career. However, here it is transferred to an emotional roller coaster, with Anneke's always amazing voice melding perfectly with the symphony until its blended together into one fluid motion that just takes you to a different world than the original did. “Your Glorious Light Will Shine,” is another standout track. This one was a metal song from VUUR’s debut (which I also reviewed and gave high marks) but, again, a stylistic change brings about other thoughts and emotions associated with the song. As hard hitting as VUUR is, the song still hits strongly but in a different way obviously—but such is the power of her music that even when it is turned upside down, the impact remains the same. Three songs from her days in THE GATHERING made the setlist: “Two Souls,” “Travel,” and “Forgotten.” In their time, the band covered a wide variety of sounds and the symphonic version of these three retain the layered depth the originals contained within them. However, the true star of this live concert, of course, Anneke herself because her vocals indeed take a life of their own. Very few singers, man or woman, have the range of emotions or depth required to pull off something like this. This is a must have live collection for fans of anything Anneke has done over the years.